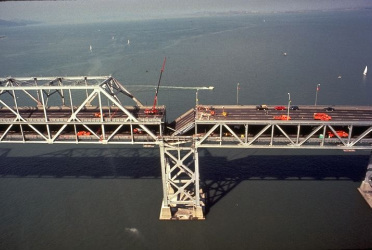 The Loma Prieta Earthquake struck at 5:04 PM, October 17, 1989. 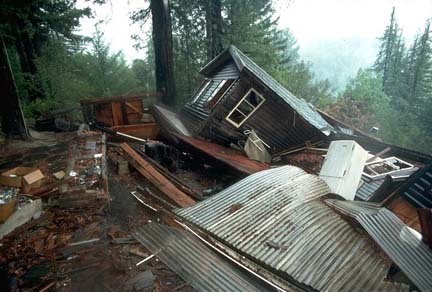 The epicenter was located in the Santa Cruz mountains, near Loma Prieta peak, about 70 miles south of San Francisco. Measured at 6.9 on the Richter Scale, the worst damage was in the nearby cities of Watsonville and Santa Cruz. There was also considerable damage throughout the San Francisco Bay Area, especially in San Francisco and Oakland. 66 people died, over 3757 injuries, $10 billion in damage. Damage was especially bad in the downtown business area. Several buildings collapsed. Two people were killed when stores they were in collapsed on them. The worst hit buildings were brick and masonry buildings, including several historic structures. The downtown business area was especially hard hit. Downtown businesses were relocated in tents in a nearby park for months until virtually all of the downtown was rebuilt. The Marina was created by filling in a shallow inlet of San Francisco Bay. The loosely compacted soils were easily shifted by the earthquake, leading to widespread building collapse. Many buildings also burned as gas lines broke. Crucial water pipes broke, adding to the difficulty of fighting the fires. The top deck of this elevated double decker freeway collapsed onto the lower deck. 42 people were killed here, about half of the total deaths. Initial estimates of casualties here were as high as 200, based on estimated rush hour traffic. Rescue efforts were hampered by fears that the whole elevated structure would come crashing down, endangering rescue workers. They had to shore up the structure, and carefully uncover the crushed cars. 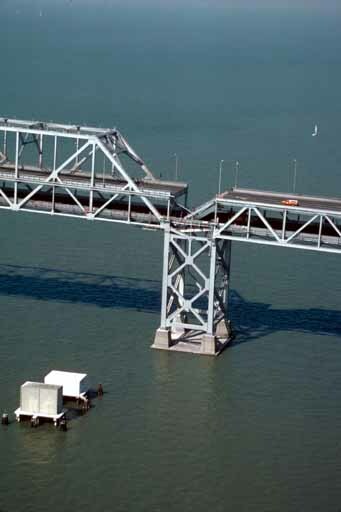 The San Francisco Oakland Bay Bridge is the most heavily used of the 5 bridges across San Francisco Bay. One section of the top deck roadway, on the Oakland side, fell at an angle blocking the lower deck. One car drove off the edge of the gap, crashing onto the lower deck and killing the driver. The bridge was closed for months for repairs, causing massive traffic jams on other routes. This earthquake really demonstrated the importance of the underlying soils in determining damage from an earthquake. Damage in San Francisco, for instance, was much worse in the Marina district, which is built on soft soils, than on the bedrock of the hills. Thousands of buildings throughout the Bay Area were damaged but the kind of devastation seen in the Marina was confined to relatively small areas. Because the quake occurred in an area that has been heavily studied by seismologists and was being monitored at the time, it produced a wealth of data that has aided our understanding of earthquakes. Study of this quake revealed that motion on the San Andreas fault can be more complex than previously thought. Instead of the expected horizontal slipping, in which the Pacific Plate moves north relative to the North American Plate, there was also vertical movement with the pacific Plate slipping under the North American Plate. These earthquake hazard maps show the expected severity of ground shaking in the San Francisco Bay Area based on the underlying soils and distance from major faults. The San Francisco Museum exhibit on the Loma Prieta quake. It includes information mostly on the effects of the quake in San Francisco, including fire and police and other city department reports. 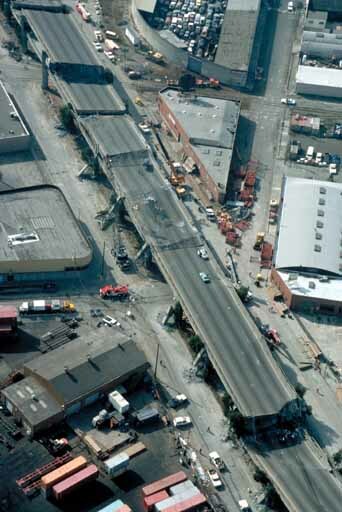 Also includes information on the collapse of the Cypress Freeway and other damage in Oakland. There is some information from Santa Cruz county, near the epicenter. This is a fantastic site, loaded with first hand stories of the quake. Don't miss the links to other Loma Prieta sites.